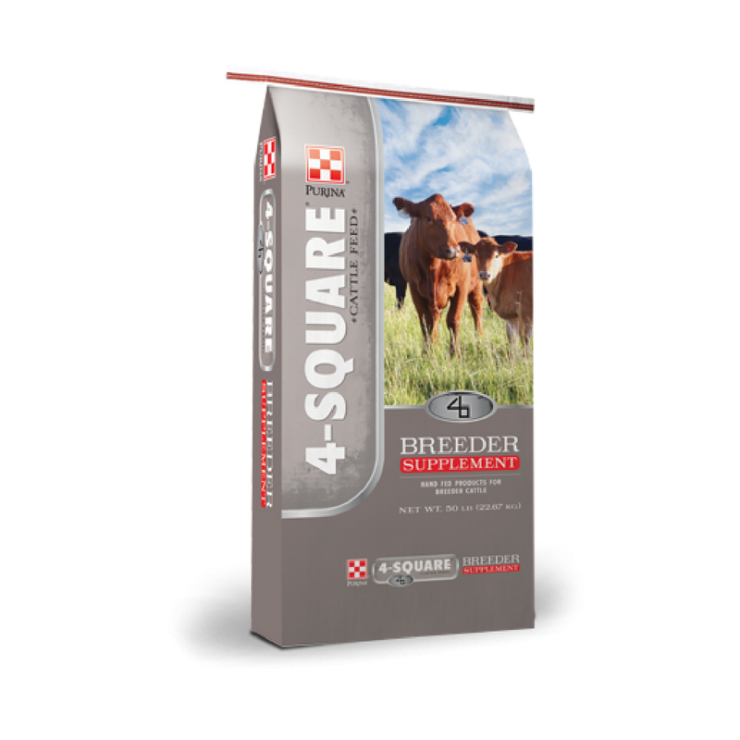 Purina Breeder Cubes are a supplemental feed for beef cattle on pasture. A cube supplement that when fed at the recommended rate balances the nutritional deficiencies in fair-quality forage (native or improved grass hay) or poor quality forage (dormant grasses or crop residues). Protein from vegetable sources and non-protein nitrogen sources Choice of protein levels: Provides flexibility to choose supplement and feeding rate that fits the needs of the individual cattle producer. Available in all vegetable protein versions with no NPN: Works well in most natural beef programs or when a no NPN product is desired. Modest amounts of trace minerals added: Flexible. Allows producer to choose mineral program based on mineral needs of the herd. Supplemental protein or energy for beef cattle on forage based diets: Increases low-quality forage intake and utilization. Vitamin A fortified: Extra Vitamin A for optimal animal health and performance. Feeding rates will vary depending on forage quality and quantity, cow body condition, weather conditions and physiological status of the cow herd (gestation versus lactation). See chart below for ranges of feeding rates: Forage Quality Gestation Lactation Transitional 1-3 lbs. 3-6 lbs. Mature (dormant) 4-6 lbs. 6-9 lbs. Follow these management practices: Monitor body condition of cows on a regular basis. 1. Recommended feeding rates may need to be adjusted depending on cow body condition. 2. Provide a source of fresh clean water at all times. 3. Provide a high quality Purina cattle mineral free choice. 4. Salt may be offered on a free choice basis when needed. 5. Consult your veterinarian for the recommended deworming, health and vaccination programs in your area.